The people who made Candy Crush think they now own the word Candy, at least when it comes to games and a bunch of merchandise. How adorable. Seems that in February 2013, the game's makers - King.com - submitted a trademark application for the word. One that on January 15 2014 was approved for publication in the United States, meaning it's only a few weeks away from becoming official. This gives King a claim on the word "Candy" in relation to all kinds of applications, from games to sunglasses to headphones to...spectacle frames, though other parties can dispute the filing. 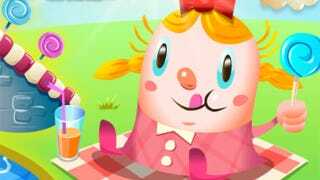 According to a report on Gamezebo, letters are already being sent to developers on Apple's App Store whose game has the word "Candy" in its name. Even if that word is literally the only thing it has in common with King's money-making juggernaut. While it's a clearly farcical state of affairs, there's a bright spot: while King.com's lawyers can send as many letters as they like, IP lawyer Martin Schwimmer tells Gamezebo that the fact "candy" is such a ubiquitous term will make it hard for much to legally stick. "Someone can't plausibly claim that they came up with the term TEENAGE MUTANT NINJA TURTLES on their own", he says. "An incredibly unique trademark like that is somewhat easy to protect." "Suggestive marks are protectable, but the problem is that third parties can claim that they thought up their mark on their own." Editor's Note: The original headline to this story—Candy Crush Wants To Claim The Word "Candy" has been changed to avoid misunderstandings about the word "own" that are clarified in the story. We apologize for any confusion. For more on why companies like King try to trademark common words—and why this may be an issue of the law being the problem—see this explainer.